Sylvia Fowles and A’ja Wilson have a “dance off” to end practice. Photo courtesy of Las Vegas Aces. Minneapolis – There was no shortage of stardom at the Target Center on Friday. Twenty-two of the WNBA’s best met in Minneapolis to practice for Saturday’s All-Star Game, giving fans a glimpse of what’s to come, while offering plenty to cheer about. This year’s edition of the All-Star Game won’t feature the classic conference match up of East vs. West. 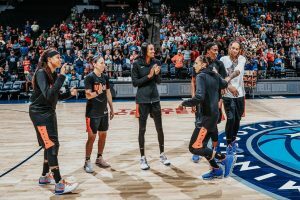 Instead, the Mystics’ Elena Delle Donne and the Sparks’ Candace Parker are serving as team captains, and they drafted teams from a pool of the selected All-Stars. Selections were announced Wednesday. 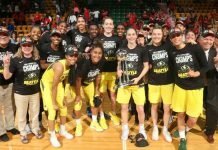 Ogwumike had to withdraw, due to illness, and Minnesota forward Rebekkah Brunson was named to take her place by league president Lisa Borders. 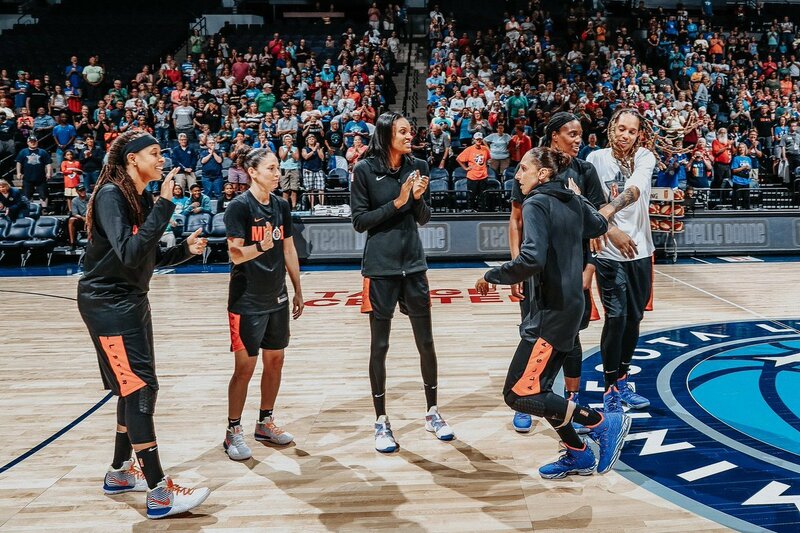 Seimone Augustus, Sue Bird, DeWanna Bonner, Diana Taurasi, Sylvia Fowles and Brittney Griner wait to shoot. Photo courtesy of Phoenix Mercury. Delle Donne made sure her selections landed teammates who can show out on an All-Star stage. That half hour tune-up was viewed by an enthusiastic crowd. 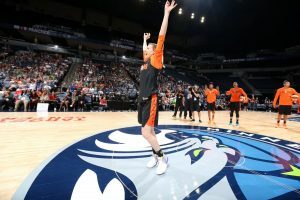 In between “real” practicing – consisting of running plays and shooting drills – there was a half-court shot contest and an underhanded game of lightning that kept things light. Post-practice dance contests were then the icing on the cake. 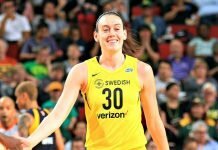 Team Delle Donne took to the court first, which included Storm forward and point guard Breanna Stewart and Sue Bird, respectively, as well as Mercury guard Diana Taurasi. For Stewart, who many consider the frontrunner for league MVP, this weekend is an opportunity to see all the talent that surrounds her. The strength of her competition is not lost on her. 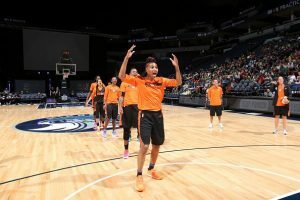 Angel McCoughtry and others on Team Parker react to a knock out contest. 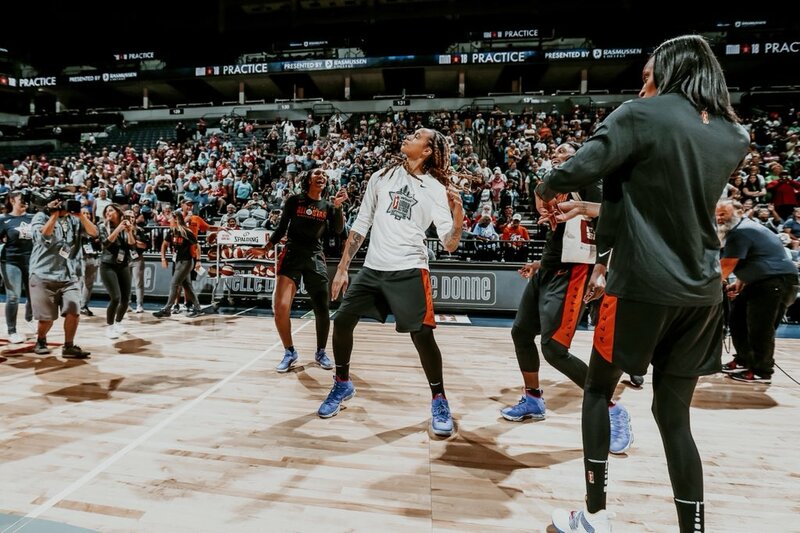 Photo courtesy of Atlanta Dream. At the same time, Stewart realizes the game isn’t true competition. Bird is making a record 11th All-Star Game appearance after becoming the league’s all-time games-played leader just before the break, marking her 501st contest. Taurasi is excited about the mix of players on hand. Brittney Griner strikes a pose. 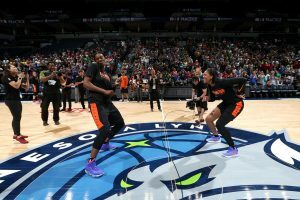 Photo courtesy of Phoenix Mercury. One of those All-Star Game rookies is Jewell Loyd, a second-year guard with Seattle. The timing was perfect for her first selection. Loyd practiced with Team Parker, joining Skylar Diggins-Smith, Cambage and the hometown favorite Moore. 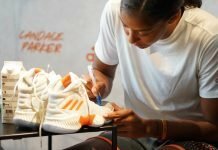 For Cambage, who broke the league’s single-game scoring record last week with 53 points, it is special to see who she’s lining up alongside with. Allie Quigley wins the half-court shooting contest. Photo courtesy of Chicago Sky. When Team Delle Donne and Team Parker tip off at 2:30 p.m. CT tomorrow, the highlight reels won’t be far behind. 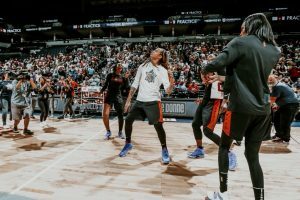 The competitive nature might trail by a bit more, but Taurasi said it will show.